It occurred to me that if you made it with rhubarb instead, you’d get a double return because after straining off the juice for the jelly, you could use the rhubarb to make a fool. If you’re feeling particularly profligate you could even serve the two together. 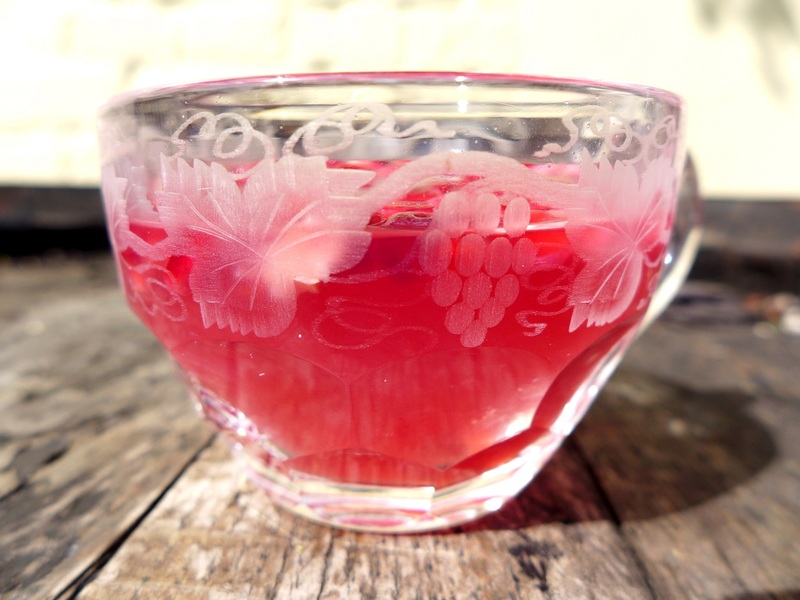 The rhubarb juice on its own has a delicate pink tinge but I wanted to boost the colour so I added pomegranate juice. 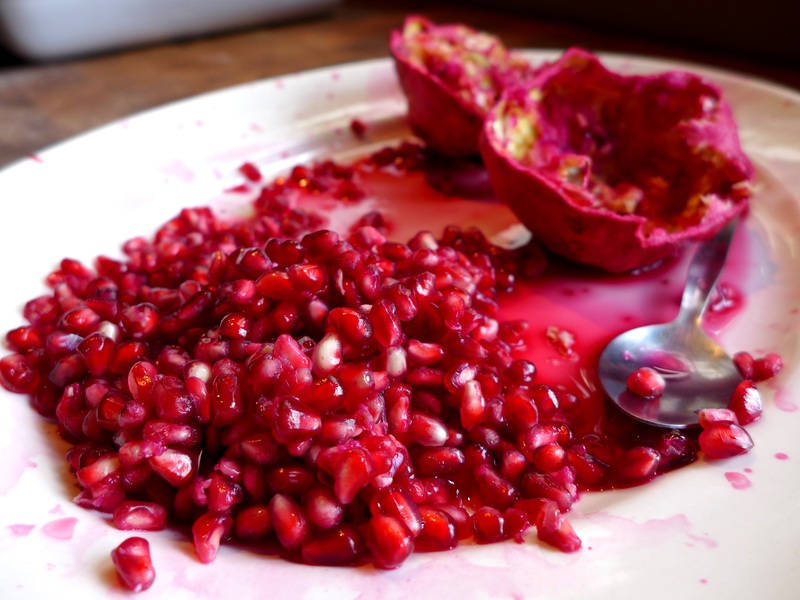 I think the two marry rather well and the jewel-like pomegranate seeds add a burst of flavour and texture, but you could also try cranberry juice. Or stick with pure rhubarb, in which case you’d get a slightly lower yield. If you make the jelly in serving glasses rather than a mould you won’t have to worry about turning it out if it’s a soft set. 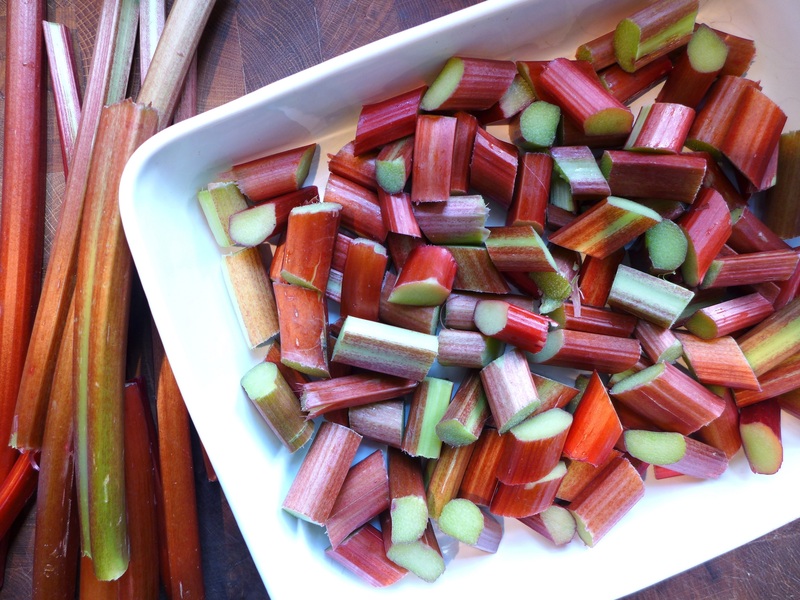 Cut the washed rhubarb into short lengths and place in a large, flattish dish. Scatter with the sugar and pour in the water. Seal with foil and bake for about 50 minutes, until the rhubarb is very tender. Allow to cool for 10 minutes then pour it into a sieve with muslin, placed over a large measuring jug or bowl. Leave it until the juice has finished dripping through. I had about 500ml. Add the pomegranate juice and measure the total. Check the instructions on your packet of gelatine – they vary in strength from brand to brand – and place the correct amount in a small bowl, snipped or broken into pieces. Cover with cold water and leave for five minutes. When the gelatine is soft, gently squeeze out the excess water and put it in a saucepan with the juice. On a low heat, whisk until the gelatine has dissolved – don’t let it boil. 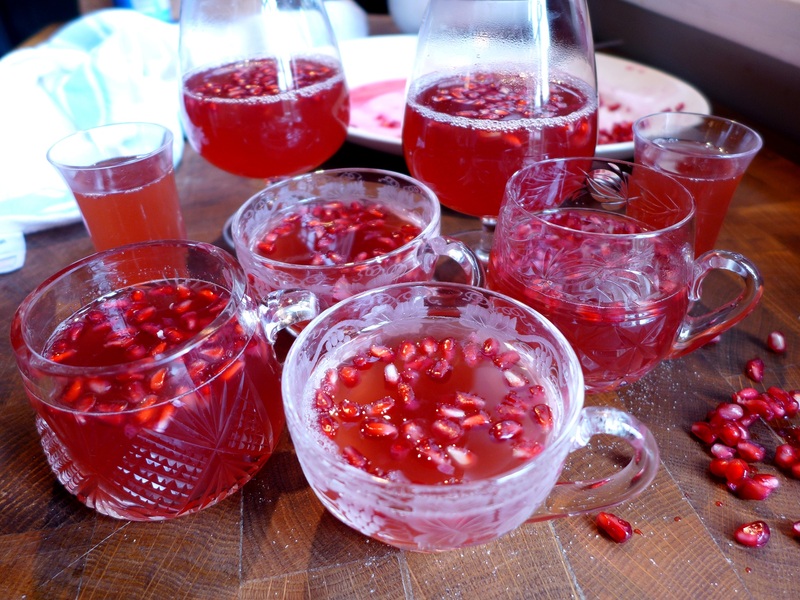 Pour into individual serving glasses and add a few pomegranate seeds, if using. They’ll float to the top so if you want them elegantly layered, you’ll have to half-fill the glass, wait for the jelly to set, add the seeds and another thin layer of jelly, wait for that to set and then top up with the remaining jelly (you can re-heat it gently to melt it). I don’t have that much patience. Alternatively, top with a spoonful of creamy fool made using the leftover rhubarb and add a scatter of pomegranate seeds. 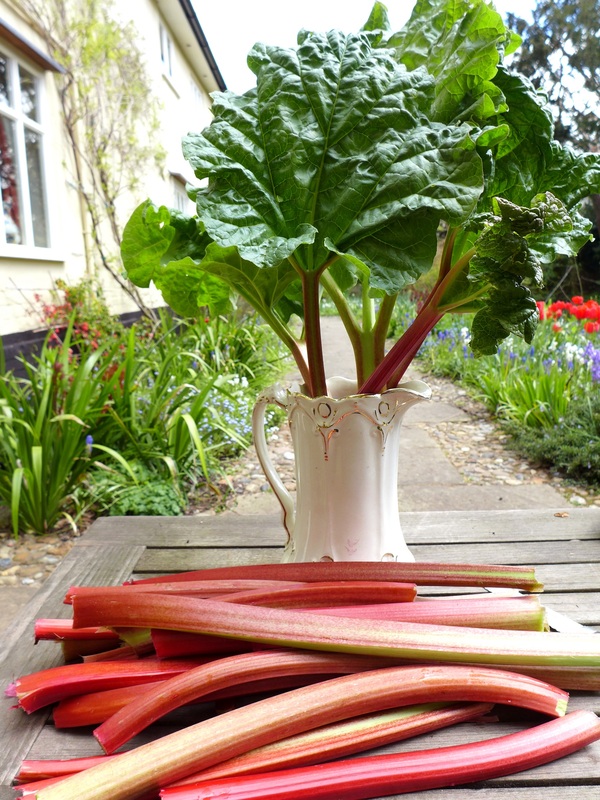 You can find a recipe for rhubarb fool here along with some other rhubarby ideas. 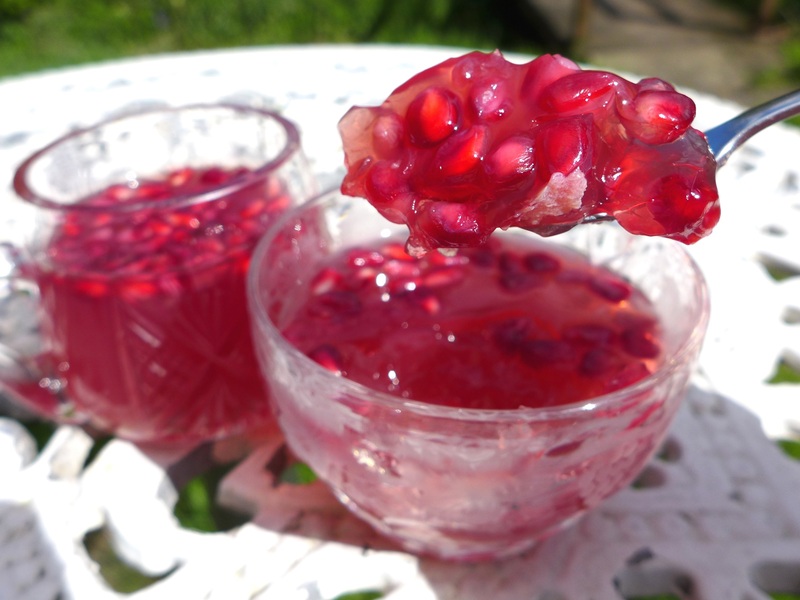 This entry was posted in Desserts, cakes and biscuits, Fruit, In the garden and tagged rhubarb and pomegranate jelly, rhubarb jelly, rhubarb recipes by Linda Duffin. Bookmark the permalink. You’re welcome! Hope you enjoy it if you try it and thanks for the feedback. Wow, this is beautiful and looks absolutely wonderful.